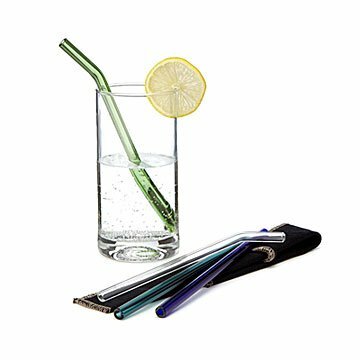 These four elegant handmade glass straws are reuseable, healthy alternatives to disposable plastic ones. Down with disposable straws! Down your favorite drinks with these elegant, handmade—and most importantly, reuseable—glass straws instead. Designed by Cyndi Sladics to protect tooth enamel from staining and acidic liquids, the set includes two straight and two angled versions in shades of green and blue, a special brush to keep them clean, and a hemp carrying case. They're made from durable borosilicate glass tubing that's hand-shaped and flame-polished. The Sladics family began Simply Straws to help stem the plastic tide that's damaging our environment. Now they're a fellow B Corp that, among other things, donates a percentage of sales to nonprofits that educate and work against single-use plastics. Handmade in Costa Mesa, California. In my water, smoothie, iced coffee!